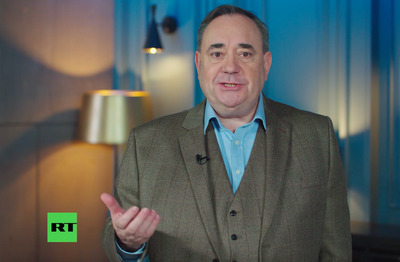 Former Scottish First Minister Alex Salmond defends his new TV show on Russian state-funded RT. Salmond tells BI that being on RT will allow him to broadcast “revelations” other channels wouldn’t touch. SNP MPs have criticised Salmond for launching the “Alex Salmond Show” on the channel. LONDON — Alex Salmond has defended his decision to host a TV show on Russian-funded media outlet RT, claiming that it will allow him to broadcast “revelations” that other channels wouldn’t touch. “I have got some really interesting revelations [on my show] which I know I wouldn’t have got [on other TV channels]” he told BI. Speaking at the launch of the ‘Alex Salmond Show’ in London on Thursday night, Salmond listed a number of prominent politicians who had also appeared on RT, and said the channel had never dictated his views in the past. “I have scanned back through Russia Today broadcasting and I counted 50 Labour MPs, 38 Tories, 14 SNPs, seven Liberals, three Sinn Fein, two DUP and a Green. They have all appeared on Russia Today programmes. So, if it’s good enough for John McDonnell, Jeremy Corbyn, Dianne Abbott, John Redwood, Crispin Blunt, Liam Fox, Ian Blackford, Vince Cable and Caroline Lucas, then I can probably withstand any criticism. The launch of Salmond’s show was attended by RT employees including MP George Galloway, plus Conservative MP Daniel Kawczynski, who thanked Salmond for sticking up for MPs like him who had appeared on RT. Former Liberal Democrat MP Lembit Öpik was also in attendance. Salmond defended his show in an interview with BBC Newsnight on Thursday, saying: “I appeared on RT programmes when I was still a Member of Parliament, it would be a bit strange if I said ‘now I’m no longer a Member of Parliament I’m refusing to make my own show with my own production company over which I have total editorial control.